Johanna A. Hightower, 91, passed away on April 26, 2018 peacefully surrounded by her devoted family. 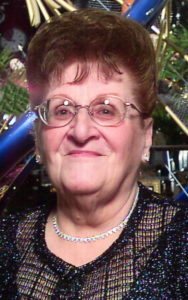 She is survived by her loving children, James Hightower, Jr., Carol (Kenneth) Otten, Carl (Marie) Hightower, Joanne (Patrick) Moccia and Joseph Hightower along with 10 Grandchildren, 22 Great-Grandchildren and 2 Great-Great Grandchildren. Johanna was predeceased by her husband, James Hightower Sr., her son, William and her Daughter-In-Law, Patricia. She met her husband James, a Georgia native, while he was stationed in Elm Park, during WWII. Johanna was an avid dog breeder and trainer and specialized in German Shepherds. She loved watching western TV shows and movies and loved listening to the music and watching the movies of Elvis Presley. Funeral will be held at Cherubini McInerney Funeral Home on Monday, April 30, 2018 at 10am followed by a burial at Fairview Cemetery. Visitation for family and friends will be on Sunday from 2-4pm and 7-9pm. My deepest condolences to the Hightower’s. Johanna was a bright star who shined the most, when her family was near. I remember Thanksgivings when Papa would bring us over for a holiday visit, one of my fondest memories as a child! Love, and hugs to you all.